The idyllic wine village Ockfen, a certified tourist attraction, lies within the charming landscape of a valley of the Saar river. Ockfen’s 700 inhabitants can look back at a 1000-year history. 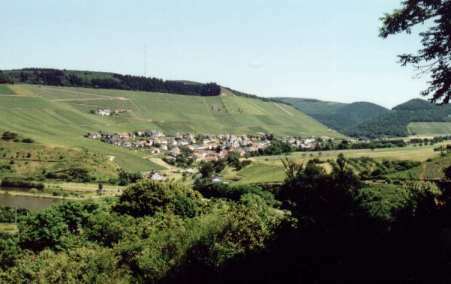 Ockfen was first known as Villa Occava, which was fouded -after the certification of the convent/ monastery by archbishop Theoderich St. Martin in Treves (Trier)- in 975 A.D.. That same year emperor Otto the Second confirmed the foundation of the convent. The convent owned several properties, especially vineyards, as well as agriculture and pastures. Even today remainders of the Convent, such as the administration building can still be seen, emphasizing their tradional bonds to the village. For over a millennium Ockfen has been devoted to the vine. The vintners have established over 100 hectars of viticulture, which helped make the “Ockfener Bockstein” known all over the world. The fruity acidity and the special bouquet give Ockfen’s wine a gentle fire, a inimitable characteristic, that puts Ockfen’s wines in the class of the best wines of the Saar valley. In addition to the wine merchants with the most innovative winemaking and wineselling techniques one can also find a small wine merchant in Ockfen, providing the visitors with different choices of buying and getting to know Ockfen’s wine. One can choose from small wine-rooms up to regional restaurants that offer a choice of Ockfen’s wines. More and more visitors find their way to Ockfen to enjoy the surrounding forests and tourist attractions, away from the commotion of the bigger cities, or to just relax.